Very disappointing. Two granny dresses. No sparkle, no glamour, no wow. Not everyone can be a Letizia. I don't think it's appropriate and nice to compare these women to Queen Letizia. Let's critique their outfits based on them alone and not based on others. And as fas as I can remember, Letizia can be very disappointing sometimes. "Granny" and "wedding civil ceremony" - rainha leonor, I love that! I was thinking "weird/ugly" and "mother of the bride". Heather, and why choose to wear a dress with a rose, a skull or Che Guevara on the middle of the bodice? I like Victorias dress. I find it feminine and pretty. Oh my, Victoria disappoints here. I can only wonder what Daniel secretly thought of this dress. 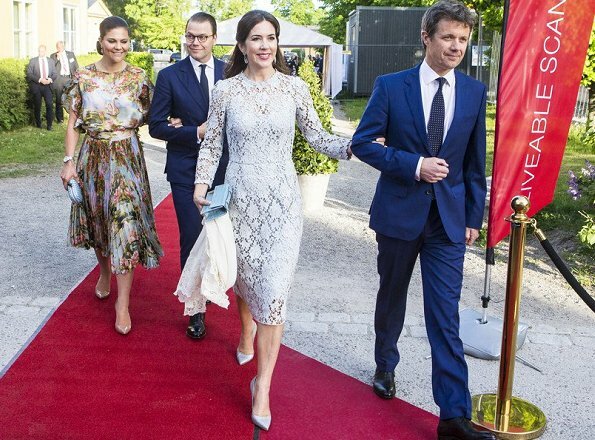 j'espère que le prince Daniel n'est pour rien dans ce choix ,cela voudrait dire qu'il ne choisit pas pour embellir sa femme . Well, I rather like CP Victoria's dress because it is so feminine and many of her outfits are more for business wear. CP Mary's is boring, like an old-fashioned tablecloth. I agree, Daniel's clothes are always on the tight fit and not quite long enough. Yes, King Filipe is a really snazzy dresser! I think he had better be, with a gorgeous wife like his. Does CP Frederik wear anything but blue? I've seen worse, it's spring after all. 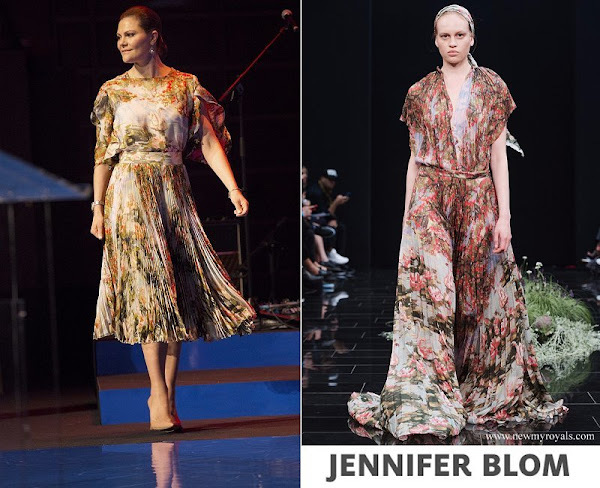 Mary's dress is blah, looks like curtain fabric. Victoria could learn from Mary that it's OK to let your hair down for a change, so tired of her bun! And I am so tired to read that same bun comment in every single thread of Victoria. Too bad. I bet you are tired of Maxima's hair comments too. Although I'm pretty sure you've commented on their hair too. Kteach; to comment something now and then is very different than writing that same comment to every single post about a person. And there is also big difference between Victoria´s completely healthy hair what she just likes to pull back and Maxima´s hair what is really in very bad condition. I don't like Victoria's dress, but at the same time, I think she wears it well and she looks good in it. I think she looks especially nice in the picture where they are all lined up next to each other, but still not really a huge fan of this dress. I really like Mary;s outfit and hair though! She should wear her hair like that more often. And the dress is simple, but very pretty at the same time. Victoria's dress looks weird, and like its several sizes too big. Its indeed "granny" on her. And she didn't bother to do something else with her hair. Again. At least Mary's hair were styled differently for the evening. I also like Mary's dress better but why again lace dress? There are too many of them around, its time for something else, please. The drawing on the dress of Victoria is beautiful but not suitable for this kind of dress, it would gorgeous on a shift dress or pencil skirt. And i am sick of lace too. I shall go out on a limb here and admit to liking (actually loving) Victoria's dress but then I've always had a leaning towards the whacky!! I think she looks fabulous. Mary - sorry, but boring and frumpy and as someone said like a civil wedding dress. My thoughts are,Victoria pulls her hair back so tight the hair is going to start breaking off and she may start having bald patches in the front . Oui ,elle veut imiter son mari qui perd ses cheveux. I like Mary´s dress here, but not Victoria´s, her skirt part is OK, but the swan is somehow in wrong place. I like Victorias dress a bit. It has nice colors and The sleeves look nice. 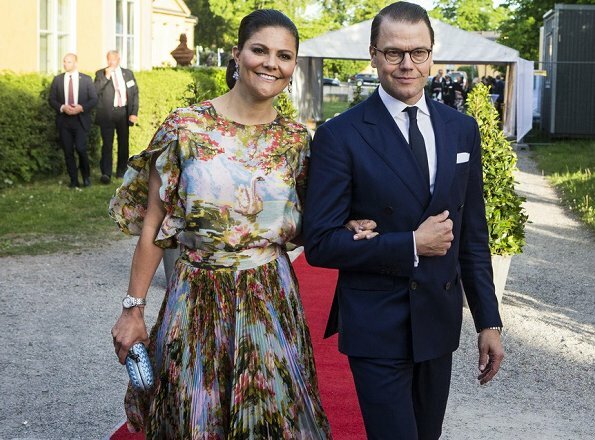 It's already obvious that both Crown Princess looked a lesser version of themselves. 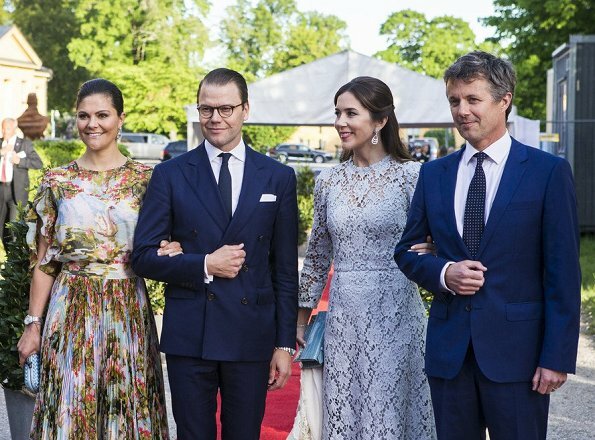 But I have to agree that Prince Daniel looks dapper in here. He always does. Unlike Crown Prince Frederick who badly needs his hair cut.